Saving MXDs to older version of ArcMap automatically? I work at a company that has three computers running ArcMap, accessing the same files and databases. Two of them run version 10.3, but we just got a new computer with version 10.6. Saving a document in 10.6 means it can no longer be opened in 10.3, which is a problem. We need all three computers to be able to open the maps. What can we do? 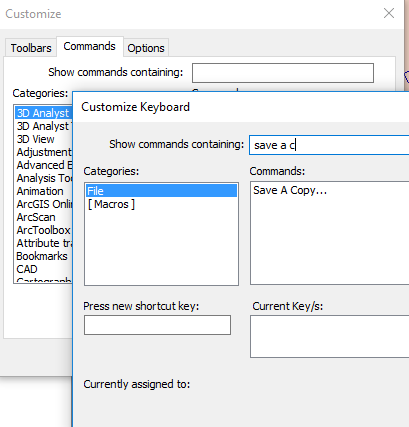 File | Save A Copy... allows you to choose what version of ArcMap to use when saving. You may be able to add a shortcut to the Standard Toolbar, or if not you can set up a keyboard shortcut to this feature. To Customize the toolbar and/or keyboard shortcuts, click on the drop down arrow for the toolbar, or go to Customize | Toolbars | Customize. Not the answer you're looking for? Browse other questions tagged arcgis-10.3 mxd arcgis-10.6 or ask your own question. Why Integrate GP tool (ArcGIS) does not use the cluster tolerance as expected? How to automatically run python code at the time when a mxd is saved? Changing MXD Reference using ArcPy?